Baffin Island study disappoints: The illusive ‘coup de grace’ on the Medieval Warm Period | Watts Up With That? An interesting, provocative claim. But what did other studies in the region find? Do they support the idea of a Medieval Cold Period in Greenland and neighbouring regions? A good task for the Medieval Warm Period Mapping Project. In this initiative we are currently mapping temperature reconstructions around the globe to better understand the medieval climate change. The ‘MWP Mapping Project’ is supported by crowd funding and has now reached a funding level of nearly 50%. More information here. The interactive map can be accessed here. Click on the dots and summary panels and key figures will appear, together with links to the original peer-reviewed paper. Red dots indicate case studies which yielded evidence for warm medieval climate, blue dots indicate reported cool temperatures (Fig. 1). Figure 1: Location map of MWP case studies in Arctic Northeast Canada and West Greenland. Numbers refer to description in text. Interactive Google Maps project here. Already at first sight it becomes clear that there are a large number of studies in the region which indicate warm MWP conditions. Are the cold temperatures suggested in the case study of Young et al. (2015) an exception rather than the rule? Do the locally advancing glaciers really indicate widespread cooling? Most of the studies illustrated on the map in Fig. 1 are not even cited by the Columbia University team. In the following we take a tour through the existing literature which paints a picture that is completely different to the one suggested by Young and colleagues. (1) This is the location of the study by Young et al. 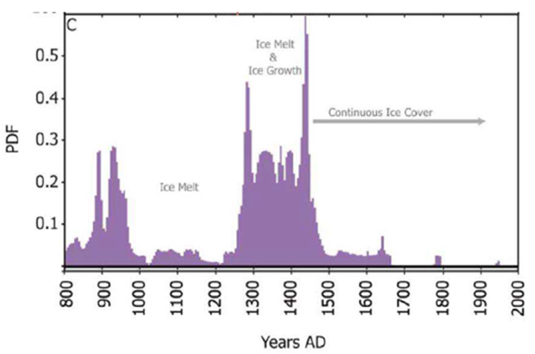 2015, describing glacier advance 1000-1250 AD interpreted as cooling climate. (2) Close-by and already different: From the northwestern part of Baffin Island Briner et al. 2009 documented a prominent glacial retreat phase 800-1200 AD (Fig. 2). Fig. 2: Time-distance diagram for glacier extent on the North Baffin Plateau. From Briner et al. (2009). (3) Anderson et al. 2008 age-dated vegetation that was buried by advancing glaciers and suggest a warm phase 1000-1250 AD. They report cooling from 1280 AD onwards associated with glacier advance. (4) This data point represents 94 glacier front locations on Baffin Island, which were studied by Miller et al. 2012a. Result: Warm phase 950-1275 AD (Fig. 3). Cooling of the Little Ice Age and glacier advance commenced abruptly between 1275-1300 AD, which further intensified 1430-1455 AD. Fig. 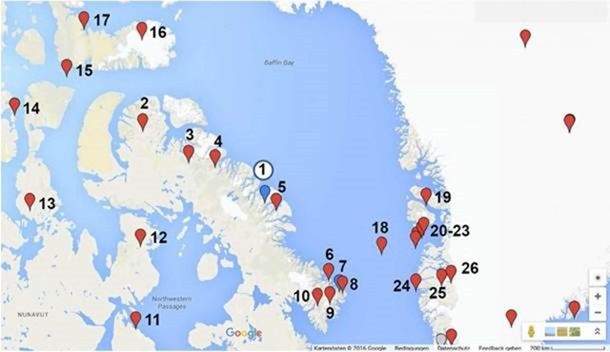 3: Ice cap expansion dates base on 94 Arctic Canada sites. From Anderson et al. 2008. (5) ‘Big Round Lake’ is located close to the Young-et-al. study area. 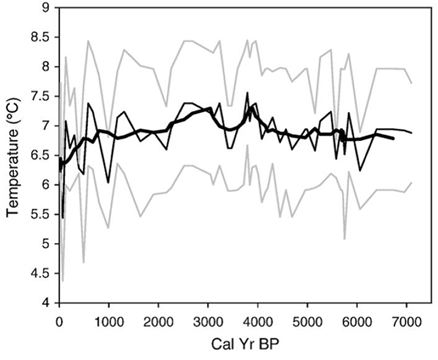 Thomas & Briner 2009 originally described a warm phase 970–1150 AD from here, which however they thought was more than 1°C cooler than the present-day temperature level. Yet, the applied methodology is not straight-forward. Thomas & Briner measured thicknesses of varves, i.e. annually layered lake sediments. For the past few decades, there is a good correlation of thick varves and higher temperatures. But is this empirical relationship really valid for the entire last 1000 years and all locations? Regional correlations seem to indicate that this may not be the case. Previously, thick varves in this case study may have been actually associated with cooler summer temperatures, as Steve McIntyre documents on Climate Audit-Blog. Meanwhile also Balascio et al. 2015 appear to have adopted the new varve model for Big Round Lake and interpret the relatively thin varves 1000-1400 AD as evidence for warm temperatures and a well-developed MWP. The phase 1200-1300 AD forms an exception when varve thicknesses increase slightly, possibly indicating a slightly cooler interlude. (6) Joynt III et al. 2001 studied diatoms in Fog Lake and documented a warm phase around 1000 AD which was 1°C warmer than the subsequent Little Ice Age (Fig. 4). Fig. 4: Temperature reconstruction based on diatoms, Fog Lake, Baffin Island. From Joynt III et al. (2001). (7) Another cold anomaly: Local glacier advance 1000-1300 AD is also known from North Cumberland Peninsula, as reported by Briner et al. 2009 who age-dated moraines. This seems to fit well with the results of Young et al. further north. Nevertheless, glacier advance can have several reasons, e.g. increased amounts of snowfall. Could this be the reason for local glacier expansion in parts of Baffin Island? Was MWP climate wetter and brought more precipitation in some areas? From Greenland we know that snow fall has increased over the past 120 years, in parallel with warming temperatures. Even today there are various glaciers that are actually expanding rather than shrinking. (8) Donard Lake is located close to the expanding MWP glaciers in North Cumberland Peninsula. Moore et al. 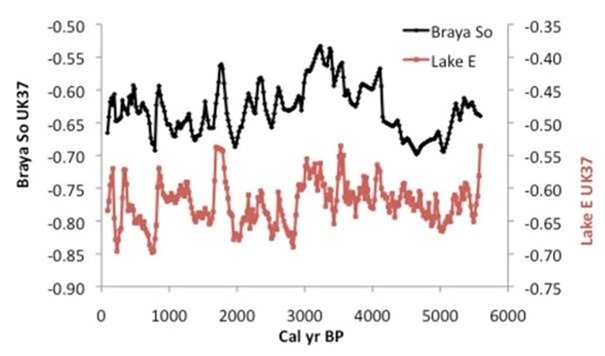 2001 studied varves in the lake for the past 1200 years and suggest a period of warm summer temperatures 1050-1100 and 1200-1375 AD, followed by cooler temperatures of the Little Ice Age 1375-1820 AD (Fig. 5). Did the short cool interval 1100-1200 trigger glacier advance? It would be important to confirm this temperature development with independent non-varve-methodology, given the controversy in Big Round Lake (location 5). Fig. 5. Temperature reconstruction of Donard Lake, Baffin Island, based on varve thickness. From Moore et al. 2001. (9) Glaciers in Central Cumberland Peninsula were expanding 1000-1300 AD (Fig. 6), the opposite development to nearby North Cumberland Peninsula (location 7) (Briner et al. 2009). It becomes clear that glacier development is not uniform across Baffin Island, hence extrapolation of results from a single glacier location by Young et al. 2015 does not make sense. It can only be speculated why different glacier areas reacted differently to climate change. While some glaciers may have benefitted from additional snow during warmer temperatures, other valleys may have been in a mountain shadow and received less snow, resulting in MWP melting and glacier reduction. Fig. 6. 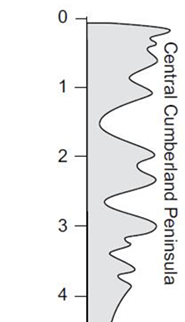 Time-distance diagram for glacier extent in Central Cumberland Peninsula. From Briner et al. (2009). Fig. 7: Probability distribution of glacier growth, based on vegetation ages buried by glacier ice. From Margreth et al. 2014. We are now leaving Baffin Island and look at results from other parts of the Northeast Canadian Arctic. (13) ‘Lake JR01′ on Boothia Peninsula was investigated by LeBlanc et al. 2004 and Zabenskie & Gajeweski 2007. LeBlanc et al. 2004 found a warm phase 850-1400 AD which shows subtle changes in the floristic composition and increased production of diatoms. A cooling 1400-1850 AD can be inferred from the decrease in diatom composition, corresponding to the ‘Little Ice Age’. Cold water indicator species Fragilaria spp. sensu lato increased in abundance during this time, followed by a significant decline after 1850 AD. Zabenskie & Gajweski 2007: A short warming, which could be interpreted as the Medieval Warm Period, occurred between [1100-1250 AD] (Fig. 9). The warming is indicated by small increases in the pollen percentages of Alnus, Betula, Salix and Cyperaceae and decreased pollen percentages of Pinus. (14) Finkelstein & Gajewski 2007: Lake PW03, Prescott Island. 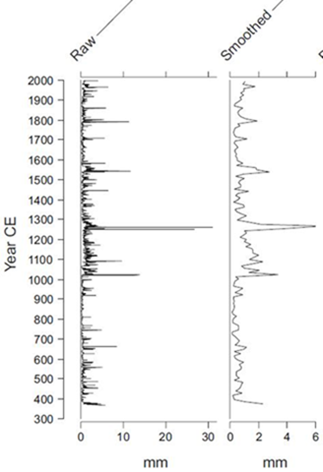 Major biogenic silica peak centred around 1000 AD indicating high productivity associated with warmer temperatures 700-1300 AD. 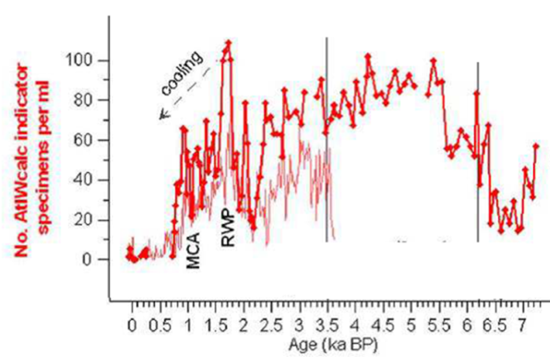 Cooling from 1300 AD onwards as evidenced by declines in warm-water indicators Navicula submuralis and Sellaphora seminulum, marking transition from warm Medieval Warm Period to cold Little Ice Age. Fig. 10. Development of IP25 sea ice indicator in an offshore sediment core in Barrow Strait. From Vare et al. 2009. (16) Paterson et al. 1977, Wolfe 2002: Ice Cores on the Devon Island ice-cap. 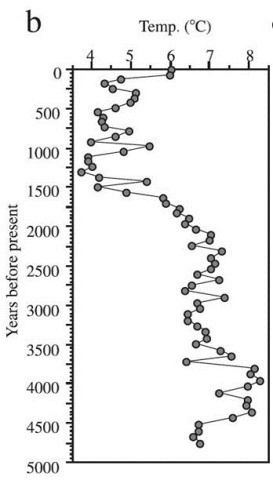 Increase in delta18O during 1000-1400 AD marks warm period (Fig. 11). Fig. 11: Oxygen isotope curve of ice cores on the Devon Island ice-cap. From Wolfe 2002. (17) Mustaphi & Gajewski 2013: Lake DV09 auf Devon Island. 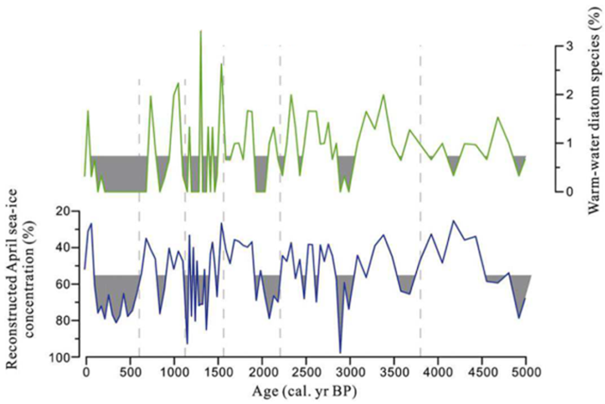 Warm Medieval Climate Anomaly (1000–1300 AD) indicated by an interval of thick varves (Fig. 12). Fig. 12: Varve thickness, Lake DV09, Devon Island, Nunavut Territory. Thick varves are interpreted as warm temperatures. From Mustaphi & Gajewski 2013. Let us now move over to Greenland (Fig. 13). Fig. 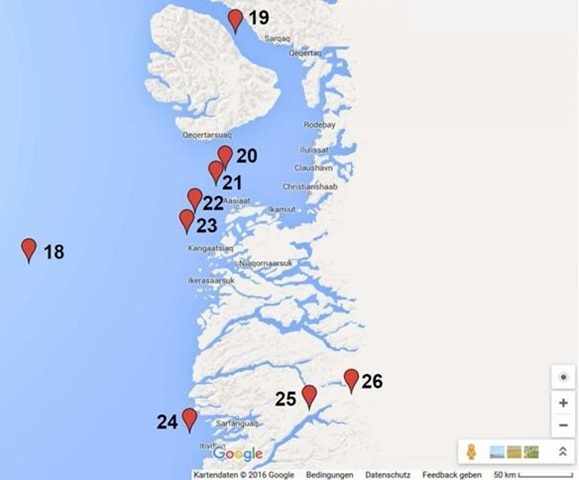 13: Location of MWP studies in western Greenland. Numbers refer to description in text. Red points: warm MWP. See interactive Google Maps Proejct here. Note limited sample density which may not allow resolving the Dark Ages Cold Period between Roman Warm Period and MWP. Fig. 14. Temperature reconstruction based on microfossils, Disko Trough. From Jennings et al. 2014. (19) Sha et al. 2014, Andresen et al. 2011: Marine sediment core DA06-139G, Vaigat Strait, Disko Bugt. Sha et al. 2014 studied diatoms and found a decreased sea ice concentration 900-1400 AD (Fig. 15). Sea ice was more common before (Dark Ages Cold Period) and after (Little Ice Age) this warm phase. Andresen et al. 2011 investigated lithology, dinoflagellate cysts and foraminifera and documented a warming phase 1000-1200 AD marked by increase in Atlantic warm water, increased iceberg calving (due to more unstable ice margin) and an increase in meltwater. Fig. 15: Sea ice and warm water reconstruction based on diatoms from a sediment core in Vaigat Strait, Disko Bugt. From Sha et al. 2014. Study for last 7000 years uses benthic foraminifera as climate proxy and finds a brief warm episode centred around 1000 AD. (21) Krawczyk et al. 2010: Core DA00-02, Disko Bugt. This study yields a very interesting result and is a good reminder of the complexity of the climate system and respective proxies. The authors analysed diatoms which indicate colder surface water during the MWP and warmer temperatures during the LIA. At first sight this seems to contradict the MWP concept. At closer inspection, however, this result makes sense. The sediment core has been retrieved from a fjord location and the applied diatom method records surface temperatures. A warmer MWP climate leads to an intensified melting of glaciers which result in greater volumes of cold meltwater in the fjord. During subsequent colder (LIA) climate, the cold meltwater stream is reduced so that warmer Atlantic water leads to warming of the fjord surface layer. This is also corresponds to the interpretation favoured by Krawczyk and colleagues. Krawczyk et al. 2013: Medieval Warm Period with cold sea surface water conditions, Little Ice Age (LIA) with warm sea surface water conditions. Anti-phase to usual North Atlantic trend. Anti-phases patterns could be linked to local hydrological conditions where increased meltwater flux generated during warm climatic phases cools local sea surface water layer. (23) Perner et al. 2013: Core MSM 343300, outer Disko Bay. 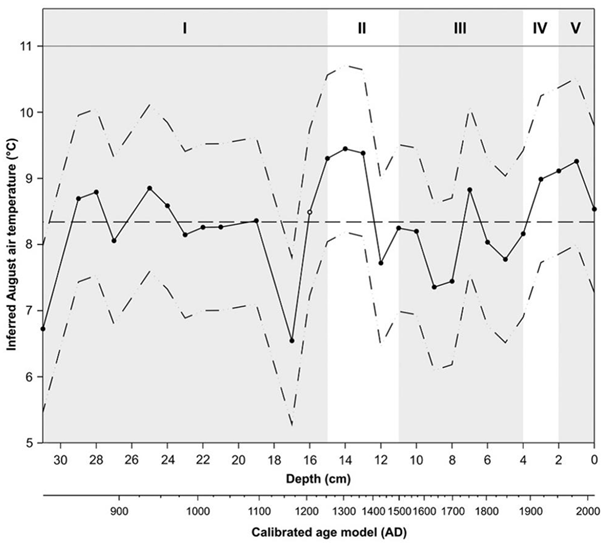 Reconstruction based on benthic foraminifera shows slight warming between 600-1100 AD, linked to the ‘Medieval Climate Anomaly’ (Fig. 16). Severe cooling of the West Greenland Current after 1100 AD, with cold plateau starting 1300 AD. Fig. 16: Climate reconstruction in outer Disko Bay based on benthic foraminifera (cooling down, warming up). From Perner et al. 2013. Fig. 17: Reconstruction of sea ice concentration in Holsteinsborg Dyb basin off Kangerlussuaq. From Sha et al. 2016. (25) D’Andrea et al. 2011: Lake Sø and Lake E. Alkenone-based paleotemperatures (UK37). Warming from ca. 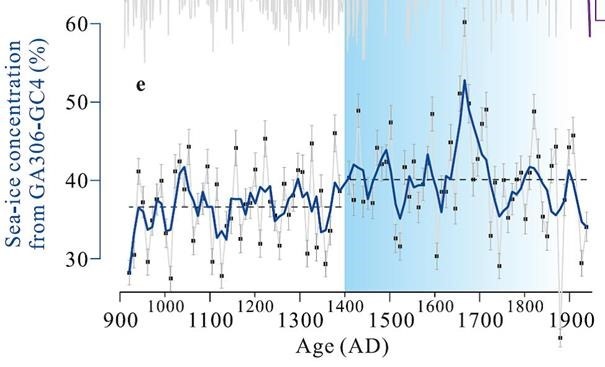 900-1150 AD, corresponding to Medieval Warm Period (Fig. 18, from Appendix of paper). Fig. 18. Temperature reconstruction Lake Sø and Lake E. From D’Andrea et al. 2011. (26) Willemse & Törnqvist 1999: Kangerlussuaq region. High amounts of organic matter 800-1100 AD indicating high productivity due to warmer temperatures. Subsequent abrupt reduction in organic matter marks cold conditions of Little Ice Age. A detailed analysis of the regional literature in Arctic Northeast Canada and west coast Greenland West yields clear evidence for a warm MWP in the region. The claimed widespread cooling during the MWP by Young et al. 2015 is unsupported and unsustainable. It appears that the authors have generalized a local glacier anomaly from a restricted area on Baffin Island and erroneously interpreted it as a regional phenomenon. Notably, there may be alternative interpretations for local MWP glacier advances such as increased snowfall. Furthermore the review demonstrates that surface waters in fjords may have locally cooled during MWP times due to increased influx of cold melt water, displacing warmer Atlantic water. In contrast, fjord bottom waters often show MWP warming. While the vast majority of the presented studies show a clearly developed warming during MWP times, the detailed correlation of onset, termination and cold interludes may differ. Differences may be caused by local climate variations, different age resolutions and time resolutions of the studies, a limited number of radiometric age dates which in addition may be subject to errors, as well as varying depositional rates and gaps in the sedimentary record which cause problems in the employed age models. Detailed correlations of the various studies are planned as part of the ‘Medieval Warm Period Mapping Project’, once the data screening and mapping phase has been completed. It is unfortunate that the reviewers of Science Advances have missed the shortcomings of the Young et al. paper and have not demanded a more thorough regional integration of the results into the existing literature. It is even more unfortunate that Young et al. chose to promote their questionable regional interpretation in a widely distributed press release that on top is written in an inadequate sensational style. Historians of Viking research are advised to check the facts thoroughly before using the disputable conclusions proposed by Young and colleagues. The author of this review contacted Nicolás Young on 11th January 2016 to discuss the discrepancy between the regional literature and the study’s claim. As of 15 January 2016, no reply was received. In contrast, Gifford Miller who declared in the press release that the study was a “coup de grace on the Medieval Warm Period” answered promptly and engaged in a constructive discussion, for which he is thanked. January 18, 2016 in MedievalWarmPeriod, Paleoclimatology. Perhaps, Nicolas Young was interpreting his chart upside down. Apparently, this happens quite often when climate scientists try and prove something fallacious in the Arctic. Apparently, this single glacier is as important as Mann’s single tree. Did you mean “elusive” or did you mean “illusory”? I wondered that, elusive= difficult to find or capture – illusive = illusory – product of an illusion. I took it as an obvioius play on words. I woudn’t change it, it captures the spirit of the article. They are trying to prove a point that is clearly ment to decienve people. These researchers are like lawyers just trying to raise a reasonable doubt. Throw poo at a wall hoping some will stick. Using just one site to refute the Medieval Warming Period is illusion, and they know it. Cherry Picking outlier data to prove a point isn’t real science, it is magic. Did they “Cherry pick” or “Ice Pick”? 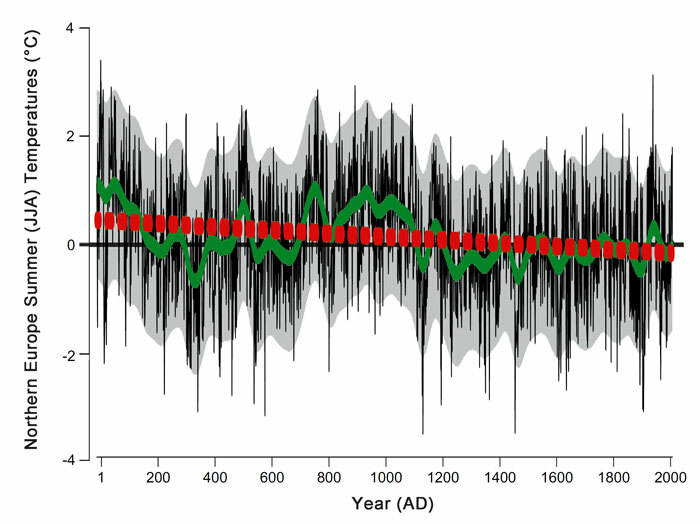 Same question – after all that, when was the Medieval Warm Period? There are a lot of time series shown with various kinds of maxima, but not much synchrony. Time to buy some new glasses..or take the blinders off !! It just needs an answer – when was it? What years are we talking about? Just like today, Nick. Some parts of the globe are cooling and other parts are warming. If one were to look at the last 120 years or so, there would generally be warming. But a proxy from one spot might show periods of warming and cooling and so the actual time period of warming from proxies would not line up perfectly from various spots, nor should it. Not sure what your complaint is really about. It is the nature of imprecise proxy data. And most of the warming is in the northern hemisphere. We don’t have a global temp. anomaly to use for the MWP so in comparing we should look at the regional effects and not compare a modern “global” temp. to proxy data and then complain that it is not global. Of course not. They are proxies from single sites and difficult to interpret. Well, at least we know when today is. But unless you give some structure to the MWP event, it’s hard to see what this all proves. It seems to me that any kind of peak (of something) between about 700 and 1400AD is held to be evidence of a MWP. On Baffin (2) we have glacial retreat 800-1200AD. In (1) we have glacial advance 1000-1250. (3) has warm 1000-1250; (4) has warm 950-1275. (5) has 970-150 but also maybe 1000-1400. (6) has a rather narrow peak at 1000. (7) like (1) has glacial advance 1000-1300. (8) is mixed – (9) also has glacial advance 1000-1300. Yes, I know proxies are individually uncertain, and weather can vary. I just don’t see how it all comes together. Your 2nd paragraph looks like you’ve been hitting the cooking sherry. Anyway, about the MWP, it would be unusual if global temperatures did not fluctuate. That would be abnormal. 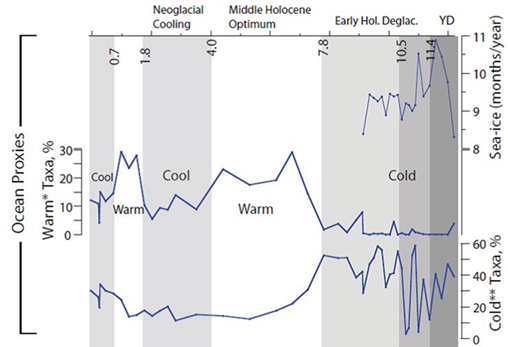 The MWP and the LIA were simply variations above and below the Holocene average. There were many such variations over the past 10,000 years. They are cycles within cycles, and the Holocene is just part of a much larger cycle. H.H. Lamb plotted the MWP many years ago. If you want to know when it was, he’s the original source. But it’s clear that you have an agenda, which requires that you try to show that the MWP either didn’t happen, or it was only regional in extent. You’re always pushing propaganda, Nick, and by now you’re not fooling people. You’re not stupid, so you’re able to put a veneer of science over what you’re trying to do here. It would be refreshing if you ever admitted what your real motives are. I don’t expect you’ll do that. But I look at everything you write with the understanding that you’re part of the problem. Yes, Nick could go to CO2 science, study their entire MWP data base, find various estimated peaks, look at many disparate studies, etc. Instead he chooses to willfully blurr. Please indicate how a uniform, global shift in climate accounts for the counter changes in the Arctic and Antarctic ice cover. Or, go through the immense mass of glacial movement information from around the globe and explain how neighboring glaciers can behave in contrary fashion. Even Skeptical Science shows the MWP. Oddly, they state that “Climate Has Changed Before” is a myth. Leaves you wondering what to believe on that page. The historical reality is that at the close of the MWP, shipd were unable to reach Greenland due to sea ice. The fact is that around the planet there are data sets that identify an “anomally,” a “warm period,” or a “drought” to the same period with some variation on the beginning and ending dates, but a generally common central tendency. The beginning and ending dates vary because of causes that you as a climate scientist understand perfectly well will result in only partial synchrony. So asking the “question” is just rhetorical pettifogging. I think a visit to the Viking Museum in Oslo, Norway will help answer some of these questions. They have extensively documented the Viking era, which coincided with the MWP, and how it ended as ports in Norway and Greenland were iced in early and opened late, or did not re-open as the MWP came to an end. The proxies are like the ice coverage on the Great Lakes. The latter haven’t been consistent with global warming in the last couple of years. Glaciers that do not flow into the sea might extend because of faster flow or greater snow fall before melting away explaining why they do not line up exactly with other proxies. Reading about the study in the press release, there should be considerable doubt about the local weather being colder than normal yet they confidently debunk the MWP in Greenland? There is some consistency there for a MWP (why must it be called Medieval Climate Anomaly? Where is the evidence that warm and cold spells are not normal?) between 1000 and 1200, while the authors seem ignorant of the archaeological evidence. The middens show a change in diet and then a drastic change as the remaining population struggled to farm. Bad years would not have been unusual but the onset of a climate that brought a few bad years in a row would have been catastrophic. Then there is the change in “Native” population. The Inuit who were capable of hunting on seas displaced the local people who were heavily dependent on hunting on ice, and there was also an invasion from Native Americans from warmer regions just before the Vikings settled. I don’t understand: I’m not a scientist, just a poor taxpayer who has to live in the real world. If I presented this to one of my clients and someone was able to provide opposing evidence of such magnitude so quickly, I’d get sacked. How does this pass peer review? I’ve made that point thousands of times. The “science” is so bad, clearly no one is watching the shop. We need to have far far far greater regulations placed on government reserach. I’m a conservative and I’m crying out for far far far more government regulations…on itself. If the oil industry produced this garbage to promote a view favorable to their financial situation the government and aligned NGOs would be all over them. In fact they have a well established and funded watch dog system already in place. Most likely funded by legal firms trying to manufacture another silicone breast implant bogus hit and run lawsuit. Loot a company, destroy countelss lives and jobs, take the money and run before the truth can be known. Not a single dime of the money looted by lawyers was returned to those robbed by the silicone breast implant lawsuit. That is criminal. Anyway, there is how Exxon counters the attacks. It is truly tragic to see how this issue has corrupted journalism, the press, science, adedemia, the legal system and the government. All for nothing, and these willing participants just don’t seem to care. I agree 200%. The quality of science in this field is astonishingly low. No references to competing studies. When traditional math techniques fail they invent new math to show something. They are not transparent whenever they can obscure. The worst articles are the ones that try to predict the future, i.e if temps go up 10 degrees like the models say then this will happen. Half the articles I see in phys.org look like stupid high school studies. There’s obviously poor peer review. “When CO2 was at 400 in the past then sea levels were 3 meters higher. Therefore sea levels will be 3 meters higher by 2020” This plant when subjected to higher temperatures … When I think of all the good science that could be done with this money either in medicine or materials science it sickening. ‘Evaluation and peer review should serve to improve standards. You must understand that the IPCC and journals have the unwritten rule allowing them to make up new words that may sound like the words in the Oxford and other dictionaries, but mean something completely different. “Just because the d-word people do not know our language or the meaning of our words, the IPCC stands completely behind what was written.” an unnamed, non-affiliated NGO member not authorized to speak to the press has stated. Magic – I missed the monitor by inches . . . . I agree as well. Does not the peer review process stop the publishing of such nonsense? The Western settlement of the Greenland Norsemen is now under permafrost. It existed for more than 300 years with horses, cattle, pigs sheep and goats being supported by crops grown on arable land. What did they feed these animals? Ice? No, because only certain “peers” are allowed to review it. If others ‘not on the same page’ were to review these studies, they would never get published. The whole ‘peer review’ process is a joke. If you read the latest scandal on peer review you will see that frequently they refer themselves as peer reviewers apparently able to falsify the content, email addresses or whatever. This happens in every science it was found and for many journals even the most prestigous. The system is in drastic need of improvement. I wouldn’t doubt if you did research you’d find that climate science is among the worst if not the worst when it comes to quality of peer review. It has to be. Just look at the quality. It’s not even a matter of outright fraud. It is simply poor quality work that doesn’t deserve to be published. …climate science… peer review… (is) not even a matter of outright fraud. But it is. The Climategate emails proved that repeatedly. The “science” is so bad, clearly no one is watching the shop. The scare quotes are astute. What is being watched, though, is Post Modern Science, subjective “science”. Unlike Modern Science, PMS only needs agreement on its models. They don’t actually have to work. We need to have far far far greater regulations placed on government research. Much, much better, take the government out of the business of academia altogether. Thanks, FDA, for the fat scare and sugar load, the extra doses of obesity, diabetes, and the mortality. CO2 is to climate as dietary fat is to health. Stop funding university research, and don’t forget to stop student loans, which are converting the throes of higher education into for-profit enrollment. With friends in the right places and if you say what they want to hear any piece of crap seems to pass peer review. There’s lots of wisdom in that short sentence. Dester, I do know enough to suspect what I wrote irritated you. In what way would you choose to refute that botany is a “naming” science? You’ll understand that I’ll very strictly enforce the difference between botany and biology on anything you choose to reply with? This isn’t science in any way Chris. It has no more scientific content than archaeology or paleofecalogy. It’s a “naming science”, similar to botany. The only problem is people have been told to expect more from it. It isn’t a theoretical science at all and never has been. It explains nothing. climate “scientists” record their observations and discuss the “meaning” of them with each other, but they don’t actually know anything other than what they’ve observed and recorded. You don’t know much about botany, do you? Mods – Sorry about publishing this under the wrong heading. Please repair. Dexter, I do know enough to suspect what I wrote irritated you. In what way would you choose to refute that botany is a “naming” science? You’ll understand that I’ll very strictly enforce the difference between botany and biology on anything you choose to reply with? What a coincidence. When I was 10, living in the desert, I got curious as to why weeds would not grow in a place that had seen some excavation. After about a year of controlled experimentation, the details of which I will not bore you with, I discovered the crucial role played by fungus. I guess in your mind, I was not doing science. I can’t be sure from the description, but my guess would be you were doing the science of biology rather than botany? Botany is the classification of plants and is a “naming” science. Botany focuses on identifying and recording unknown sessile life. Biology focuses on how those life forms work. It remains my guess that if you were attempting to explain the interaction between fungus and plants in the desert, the science was biology, not botany. Maybe if t authors spent years in the field and received lots of grants, the reviewers feel that whatever “findings” it found deserve to be put in print for that reason–so that the time and money weren’t wasted. Lamont and Doherty observed to be turning in the earth. So the smallest and most localised study is the one that proves that the MWP wasn’t global? Do these people not understand how ludicrous their claim is? All these studies are with one (1) basic fault, they have absolutely no idea how big the world is. Sail from New Zealand to South America and you will think you’re the First Human to pass this part of our planet. We sit on one third of this planet (of which we know nothing), try sitting on the other two thirds and you would sink. Go travel the world (not the beanfeast world of the climate idiots) but the unseen world of the adventurer, then take your time to write something constructive. Even South Africa to Buenos Aires @ 15 knots is about eight (plus) days. And you see very little – cetaceans if you keep a very good look-out; albatri/albatrosses; and, perhaps, a couple of ships. There are other ocean passages of the world with less activity . . . .
Auto – still in shipping . . . .
Hey, Mann used one tree, so the precedent is set in the minds of the CAGW crowd. It was a raspberry tree, so Mann was giving us the raspberry. Exactly. There are dozens of studies all over the earth showing a warm period during this period around 1000AD as well at 2000, 3000, 5000 BP. If they don’t like the MWP they are still faced with the fact that 5,000 years ago it was the holocene optimum and civilization started with warm temperatures warmer than today. CO2 was still near 270. How? An article which looks at a single glacier when we are talking about GLOBAL warming is ridiculous. There are studies showing warming in the south pacific very reliable at the same time. They describe the warming as PATCHY. Since when does the whole globe act in concert? What is needed is not that the temps were identical at exactly the same moment in time but that they all followed a trend up during a period. First, our time estimates are not that accurate so you can’t pinpoint things that precisely. Second if temps moved in synchrony to a high around 1000AD and persisted for century or centuries that is a warm period even if each point on the globe didn’t see the peak at exactly the same moment. I have also tried to point out that denying the warming was global is MORE of a problem than having a consistent high. If you have patchy warming over hundreds of years you have to explain how that is possible. Why would regions stay warmer for centuries or colder without it being global? Explain that. Try to explain the energy balance of that. Try to have a model show that? Lastly, the LIA is much more of a problem for them than the MWP. It is clear that there was a warming after the end of the LIA. This warming has continued for hundreds of years and is probably responsible for some of the warming from 1910-1940 which cannot be explained by CO2. Because there is no proof that the warming from the end of the LIA has stopped it could also have been responsible for the warmth between 1975-2000. The IPCC thought they had discarded that because they had figured out the attribution of heat earlier in the century and had thus accounted for natural variation. However, starting in 1999 a pause that they did not predict has no natural variability they understand therefore proves the idea they understood natural variability enough to ascribe cause to the 1975-2000 warming is rendered dead. Therefore they have no idea how much of the heat from the recovering LIA is part of the warming from 1975-2000. An article which looks at a single glacier when we are talking about GLOBAL warming is ridiculous. Refereed papers I’ve read, written and even refereed in actual science journals would never be published without mentioning conflicting results, they just couldn’t be. Whenever the balance of evidence (which we assume has also been rigorously reviewed) is contradicted by a new, outlier observation, it’s presented as “oh! Look! isn’t this odd!” It isn’t ever taken as the game changing evidence all other research is incorrect and invalid. You really need to make a very humble and well founded case. In general you just report the anomalous observation and conclude it’s interesting and may warrant further study. I don’t know if the actual paper is as egregious as claimed in this article. If it is, there’s no hope for their review system. How many glaciers did Young et al look at before they found this one? There are a lot of glaciers to choose from. Why this particular one? Something I have not seen mentioned above is that the increase in the speed and footprint of glaciers in Antarctica has been touted as evidence of rising temperatures and ‘global warming’ caused by human emissions of fossil CO2. This subject was discussed here, and the article claiming exactly that, a few weeks ago, not so? So how is it that in Antarctica glaciers that flow faster indicate warming but glaciers that flow faster in Greenland indicate cooling? Which contradicting claim rules? Crispin: This reminds me how about 5 years ago there were very high estimates of the glacier flow of landlocked glaciers. This was because researchers were consciously or subconsciously looking for what they wanted which was fast moving glaciers. They found some, documented them and then extrapolated all land locked glaciers to the ones they studied resulting in fantastic amount of glacier ice loss. Along comes satellite measurement of mass changes and it shows that the glacier loss has to be less than 10% of what they had calculated earlier. They had chosen glaciers with anomalous behavior surpringly (NOT). I am convinced there is a terrible amount of this self-confirmation bias in a lot of the research in this area. It is obvious if you look at it at all. I just read an article how GISS pulled SST (sea surface temperatures) from the data set in 1998. Hansen apparently argues that the sea surface temperatures are not important because we are looking for air temperatures a meter off the surface. Since the sea surface is much less volatile let’s extrapolate our land surface temperature (with adjustments of course) to the oceans. Also, since surface of the ocean covered in ice will show no increase in temperature (being locked at 32F) then it is also meaningless so lets replace all the sea and land with ice with extapolated air temperatures that otherwise don’t have any measurement devices to validate. This all makes the GISS dataset much more extreme especially when including adjustments which for inexplicable reasons raise temperatures another 0.35C and also introduce cooling in the past. Cool gimmicks like this removing SST are hidden in all kinds of things. The UHI missing from the adjustments is a case in point. The question then is what Hansen is doing legitimate? What is the importance of temps a meter above the water? There are no living things there. It is simply fiction to subtract out SST and then replace it with land temperatures. To be honest he should simply say GISS is land temperatures only. We think ocean is different and we are not sure what to measure there. However, that would be difficult to explain and would invite criticism that they aren’t measuring the whole earth so instead he fabricates a new thing for which there is no actual data which is the temperature a couple feet over the ocean surface. This might not be so bad if the ocean weren’t 70% of the surface of the earth. We are constantly confronted with what appears to be manipulation from this science. If our goal is to measure the effective temperature rise on living things then maybe some entirely new measure is needed. If the goal is heat in the atmosphere from a volumetric point of view then the satellites give that. Of course the satellites don’t show any warming for 20 years and show half the 2m height adjusted thermostats show for the historical record. If Hansen argues the satellites are wrong then it seems to me he also needs to explain how the surface temperatures are getting warmer faster than the volumetric air temperature since by physics CO2 would heat the volume and only half the energy from CO2 would make it to the surface. This is reflected in every book or article I’ve read on climate science. Maybe there is some reason I don’t know about but I also don’t know what significance the higher 2M temp is over the others. Lastly, like others I find myself still confused how the UHI adjustments are handled in the adjustment process. According to the articles ive read the explanation is that UHI is an insignificant component of overall heat contribution to the earth. Maybe so, however, it’s clear that a very high percentage of thermostats used in the land surface record are close to urban areas which are noticeably warmer than outlying areas. It simply defies all sense that the temperature record is unaffected by this clear bias. As has been shown recently the deviation from satellites has occured in recent years when the growth of cities would easily explain the higher readings and explain the fact that the land records with adjustments do not correlate with either: 1) Satellite measurements, 2) Radiosonode measurements 3) SST measurements from ARGO, 4) Unadjusted land records and 5) Perfect thermometers (i.e. thermometers placed well and with reliable records). All these other measurements of earths temperature report roughly half the adjusted GISS land records that Hansen touts. Most important to me is that the satellites themselves are 14 of which they cross check each other providing redundant data and even the ability to vote. Land thermostats have a critical problem. They never have a backup thermostat in any close proximity (a few meters) nor a third thermometer so that if the 2 other thermometers differ we can vote to figure out which one to believe. The satellites can do this. They also confirm their data with Radiosonodes to verify if the devices are accurate and in tune. Lastly satellites cover the globe unifromly which we all know is a major probem for thermostats which are extremely sparse in many areas to the point of ridiculousness. Microclimates can show temperatures several degrees from each other just a few hundred feet from each other. You can see this trivially by going to Wunderground and looking at the thermostats across an area. They have hundreds in the bay area and depending on which thermostat you pick for a 100 square KM area or 1000KM or more area you can get radically different climate record. Thermostats are simply ludicrous to use especially when satellites exist as we have them, 14 with cross check and everything. The question is why does Hansen insist on using the incredibly problematic land data when there are alternatives that are so much more righorously demonstrably better. It seems not to have occurred to these revisionists, that more precipitation would occur as snow with milder arctic temperatures. Here, north of 60 ,we joke it has warmed up enough to snow.Very little snow falls at -30C or cooler. I could not locate their glacier of choice, but let me guess on a highland near the sea? Such that the prevailing wind would sweep over the water then be forced to climb over the land? Desperate times make for desperate revisions of history. Could not have possibly been warmer back then, otherwise our archeologists would be jackhammering the people they buried with shovels out of the permafrost. Brewed any good Greenland beer from locally grown hops?. Also obviously there were no native trees, the vikings organized logging expeditions to Vinland, just so they could build their homes and churches. I wasn’t aware of that. Oh wait, you’re not being serious. My brain is still foggy. Actually, there were no native trees to speak of. Bob, stone boats are made of wood. They’re not made of stone, they’re for moving stone. Confirmation bias is a widespread affliction in climate ‘science’. Truth is subtle and elusive. Stupid wears a tutu and feather boas. I’m sensing feathers in the air. This team would have found what they needed (and they surely looked only for proof) if they’d simply studied the dry arroyos of New Mexico. This is a case of seeking that which will validate your expense form. The report delivers all the possible value that can be culled from a sample of one. This is a case of seeking that which will validate your expense form. I wonder what mechanism the MWP Deniers propose to keep the warmth localised for periods of many decades? Bingo!!!! I reached the exact same conclusion below in the deer in the headlights post. They just make these claims without ever explaining why and how. This is the most pathetic science I know of. CAGW alarmists really hate the MWP, although literally hundreds of peer-reviewed papers clearly show it existed and was a global event. The Climatgate e-mails clearly show the sheer trepidation CAGW alarmists have concerning the MWP, as their precious hypothesis can’t explain how the MWP could be 2C warmer than now with CO2 levels as low as they were during the MWP…. What you say would have been true back in the day when science was honest and real. Strong contrary evidence would refute an hypothesis. But not anymore, not in today’s politicised science. Nothing refutes anything. If you don’t like a study, just ignore it. A hundred studies? Ignore all of them. When one finds out how easy this is it is truly liberating, in an Orwellian kind of way. Yes, a real MWP destroys their models. One would think current observations would work as well. The CAGW facade rests on one tree, one glacier, highly variable ship bucket SST readings while ignoring Argo floats, ignoring satellite data, ignoring the real benefits of CO2, ignoring hundreds of failed disaster predictions. Look, you can get radically different climate effects between closely separated measuring stations. Just look at the Swiss Alps this winter. 1. Ovronnaz on the north side of the Rhone valley (SW Switzerland) at around 2000m currently has record snow depths, courtesy of some very heavy dumps on a SW wind in the first half of January. 2. Bosco Gurin, San Bernadino and Campo Blenio, stations between 1100 and 1600m in Ticino, south-central Swizerland (which get most snow on a southerly to south-easterly wind) have snow depths far below average, despite reaching record depths of recorded history (between 40 and 80 years) in the past year or so. 3. The Engadin valley in SE Switzerland (which gets snow on a SW wind when fronts penetrate significantly into the european land mass) also has far, far below average snow – look at Maloja, St Moritz. The southern side valleys off the Engadin are in a similar boat. Within the past two years, record snow depths were recorded in the Engadin too. 4. The Northern Swiss Alps, courtesy of snow the past week on a W-NW wind have topped up their snow depths to above average the past week. Switzerland’s not a very big country, but if you look at particular weather stations, you see very different outcomes depending on the direction fronts hit the mountainous regions there. I’m sure you’d find similar results over a climatic period of time if certain weather patterns prevailed over others during that time. If that’s the case, why can’t it also be the case in Baffin Island or Greenland?? According to the Oz BOM who use world’s best practice to determine temperature, you need to compare one region’s data with several other regions, no matter how far away they are, then adjust the heck out of them all to get the number you first thought of (or want it to be). Then, you get a ‘subject matter expert’ to review the figure to the ‘correct’ value based on their intimate knowledge of the subject (and a wet finger held up to the wind). You obviously cannot believe your own, lying eyes (or readings, or experience). No reason at all. They call it “global” and “climate”; it isn’t one spot and it isn’t one month. But Marxism is closely associated with the Hegelian Dialectic; thesis, anti-thesis, synthesis. The MWP is the thesis, this fellow is presenting the anti-thesis, and the community at large believes some sort of compromise is in order. They don’t understand the scientific method isn’t about negotiation because they aren’t scientists. That’s why Dr. Lüning’s team uses so many different locations, and they’re adding more all the time. There is of course also the minor problem that studies from China and India show clear evidence of the MWP. The Imperial Chinese bureaucracy tracked crop yields rather carefully and studies of the northernmost limits for cold sensitive crops show clear evidence of a MWP. In fact these records show citrus fruit was grown further north than is possible today. None the less the AGW crowd will contnue to claim that conditions on one glacier in Baffin Land trumps everything else in the same way 1 tree on the Yamal peninsula was evidence of global climate. Sorry, here is the exact clip. Peer review, not observations, data and reproducibility is what determies the truth. The scientific method has no place in climate science, only polls, opinion and peer review count. Thomamn, that analysis is pure Genius, absolute Genius. That proves you are not a climate scientists, and therefore your conclusions are not peer reviewed and valid. Your IQ has disqualified you from ever making a significant contribution of the field of climate science, and your articles will be banned from any climate journal. This video clip provides the proof of how the system works, and you violated it. Strongly reminiscent of Dr.Mann’s Bristlecone Pine cherry picking exercise. Likewise the refusal to engage with constructive criticism. If the science is as settled as rhey claim, why do they continue to carry out these studies,? When the MWP showed up in China and India, as well as Peru and Australia, you would have thought that they would have thrown in the towel on the MWP. It must be the smell of a Grant that propels them onward. OK folks, let me put my head above the parapet on this issues once again, but only to focus the debate so that you may win it properly instead of looking silly in another round of mutual backslapping while spitting on the opposition…. The debate has never been about whether a particular region had a period between, say, 800 and 1400 CE, when the temperatures were as warm as, or warmer, than the present. OK, so we are here recognizing that. 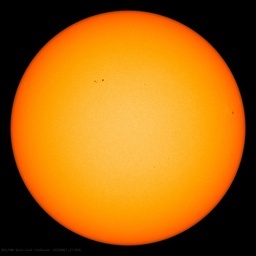 But nor is the debate even about whether a period warmer than the present, between, say, 800 and 1400, can be found at locations around the globe. Moreover, even if you found such a period in every single proxy record everywhere around the globe still you miss the point. What the argument is about is whether all the ups and downs cancel each other out. Or whether, indeed, they add up to a generalized warming at a particular time around the globe. Now, I notice that most of the cases above overlap around the 12th century. This is the time of the north Atlantic warm period that has been mostly uncontroversial for most of the last 50 years. What needs to be shown is whether warming during this century is general around the globe, especially in the far east and in the south. This is the case that needs to be made: do you have an accurate well distributed sampling that give this result? In many presentation on this topic this is not shown. But the it is shown but for another century. Indeed, last time I got smashed on this issue, folks kept pointing me to Loethle & McCulloch (2008). But that shows the peak before 1000 CE. There is actually a decline in temperature throughout the 12th century with a low point at 1200. What the argument is about is whether all the ups and downs cancel each other out. And who would be the goal keeper on that subject Berniel? As I recall, the same criticism was made of the land/sea surface temperature data, the results of which included the design and deployment of precision orbital instruments with uniform global reach. Those instruments, which have been producing verifiable data for over 30 years, are still disregarded by proponents of he AGW hypothesis. Quite a few published studies support the MWP hypothesis, and still we have argument on this “settled” subject? I’d just like to know when “the debate” will be “over”? Of course I’m joking with you, but it does seem a little facile to be declaring victory as the result of a single study, don’t you think? The situation at the moment might be that we don’t know. The proxies just arn’t reliable enough and especially not in establishing subtle trends of fractions of degrees in a single global temperature indicator for all the land and sea surfaces of the globe from decade to decade, or even year to year, in the distant past. That was the view of two influential IPCC lead authors, Tom Wigley and Tim Barnett, before the Hockey Stick. And it remained their view long after. When I discussed global mean temperature with Tim Barnett a few years back, he was so skeptical that he referred to this indicator as the idiot number, whether proxy- or instrument-based. The Climate Gate emails reveal Tom Wigley’s continuing skepticism at least of tree ring proxy aggregation, but I see no reason to consider that he has changed his view generally. Nor do I see any reason to disagree with them at this stage, and perhaps not until there is a major break though in proxy technology. It does worry me how upset folks get when one finds agreement with many on the other side of the debate and doubts all clams at establishing a GMT trend. Whether variability measure in 1/100 degrees from thousands of thermometers, or from various satellites on variable orbits, or in 1/10 degrees by trees etc, perhaps it is idiotic to even argue for any claim. Perhaps it is distracting (just as is arguing over the right modelling of climate sensitivity) from what we should really be doing, which is to call out the hubris (of Mann etc) in even pretending to such knowledge. Glacial advance or retreat may simply be the result of changes in rates of precipitation. However why would you consider this when it doesn’t support the conclusion that you have reached before you began the study. Exactly right! Greenland was 8C warmer for a long time in the Eemian optimum but it retained its high altitude ice cap. Precipitation IS the key to this, getting warmer increases precipitation which is snow at higher altitudes so increased glacial flow is simply NOT a proxy for temperature. Over 200 papers focussing on places all over the globe. Yeah, it’s clear from this map that MWP is dead. Wow. So that glacier is the key glacier just like the one tree was for Mann. So, let me see if I have understood this correctly: “global warming” is evidenced by a trend in an average calculated from temperature sets at multiple locations across the world, which may not themselves be individually “warming”, but an apparent absence of warming at a single location demonstrates that the Medieval Warm Period was not a global event? Am I missing something here? Or am I just too strict on this whole logic thing? You know, law of the excluded middle and all that jazz. It is all a matter of interpretation. Highly educated Climate Scientists will tell you that many data points demonstrating warming are “patchy” and “isolated” but sparse data points indicating cooling are global . Only for the MWP though. Nowadays, there are no data points indicating cooling because they are all adjusted to give the “proper” answer. The true horror here is how they are now desperately trying to wipe out ALL warmer periods and the goal is obvious: they actively want to have the Little Ice Age as ‘normal’ and go back to that terrible time. They can “want” whatever, doesn’t mean the climate’s going to respond to ANYone’s thermostat–except the Sun’s. I skimmed through the paper and I think I could draw different conclusions from their data, or at least a viable alternative interpretation. Glaciers are funny things and they don’t always do what you expect. In the review and discussion, they cite some of the same material that Sebastian presented in this post, but they draw the opposite conclusion. The paper has served its purpose, which is to support a hysterical news release. File it under F for “foregone conclusions”. It reminds me how up until about 5 years ago they were claiming 10 times the landlocked glacier flow than was actually happening. Of course they go and measure the glaciers they see moving. Then they extrapolate to all glaciers. Only when a satellite measured the overall mass it showed that total glacier loss is 1/10th what their estimate was. Not only that they had assumed Antarctica was losing ice for a long time only to find it is gaining ice overall. This is a bizzare claim, and raises the question, if some natural phenemenon can cause such extreme localized extended periods of warming, why can’t that natural phenemenon not be causing the warming today? There are temperature differentials between the N and S Hemi. How can we be sure that that isn’t the same phenemenon? Also, what theory can explain such extreme localized temperature differentials? What could possible turn on the heat in one area, and keep it cool in another to such an extreme and extended period of time? By what mechanism could extended warming be localized to one area? Is there a localized green house effect? Just as there is no real valid theory to explain how CO2 can warm the oceans, cause record day time temperatures, increase before temperatures to end an ice age, fall before temperatures to go into an ice age or cause a temperature differential between N and S Hemi, they just make these assertions without ever having to explain WHY. Why and How would there be localize warming? 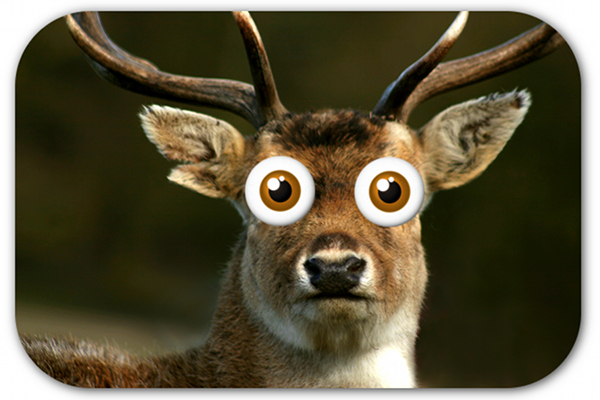 Ask these researchs WHY and I bet they look like a deer in the headlights. This is my point exactly. When I was talking to the climate modeling chief of LLNL he said that MWP was regional. I asked how could there be such localized effect for hundred years? He had no answer. He prefers to “believe” that then believe his models are wrong or have to figure out how to get a MWP into their models. I have no idea why they prefer the former answer since they don’t assume any other random measurements they get from boreholes or trees are “localized regional”. Possibly they can’t tweak the models enough with solar input to get the change needed without compromising the CO2 dominance they need for the 20th century. I don’t know. I just think it is a bizarre behavior that needs explanation too. I say that because it is more difficult I would think to explain regional phenomenon as you point out and also to put every measurement of the past into the regional category until proven non-regional in which case we’d have virtually zero temperature history to go on. I’d like to get my hands on some of the same drugs these guys are on, being completely detached from reality can be useful every once in a while. Especially now when figuring out my taxes. WUWT, here is a video explaing the possible “why” a local warming occured. The answer is “we need understand these better.” It would be nice if WUWT comissioned a series of articles to refute each one of these videos. There are plenty of them to refute. Note at exact clip of this video. He addresses cherry picking. Accuse others of what you are guilty. Also, note the certainty of the language. Only CO2 could have caused these changes. CO2 and only CO2, there are no other options…like those that caused greater warming in the past. Congratulations to Sebastian and the Project for collecting this information into this useful post. The science literature is too often hidden away from the public, with only cherry-picked selections shown to the public. This serves neither us nor the scientists producing this work (except for the minority producing politically useful conclusions). Posts like this bring a more complete range into the sunlight. Note the volcanic activity that resulted in warming and cooling, the current period looks like the MWP, and the period prior to today looks like what would be cooling. WUWT should commission a series to refute these videos. This article contrasted with the porpaganda techniques highlited in this video provide a great expample of how one side masques the truth and accuses others of what they are guilty. BTW, clear evidence of a propagandist is that the comments are disabled on those videos. You will never see WUWT or a true scientists or skeptic turn of the comments. That is how you seek the truth. You defend your position against all comers. Don’t forget that there are two different standards of proof at play here. If someone wants to claim that the MWP existed then they also need to prove that it happened everywhere at the same time. On the other hand, if you want to claim “the hottest year ever” you only need the average temperature to be high. For that there is no requirement for it to be the hottest everywhere. The most annoying feature of the reported graphs is that there is no convention as far as age–some age left to right, others right to left. When one has no error bars on the temperature proxies–? I’m amazed that pure historical facts are brushed aside and ‘falsified’ by proxy information. How can one logically interpret the re-appearance in recent decades from under melting ice in western Greenland of farmsteads that raised crops, sheep, etc., other than by concluding the farms were active in a warmer period? How is it that historical records of wine grapes having been grown in Scotland during the Middle Ages can be ignored. Can they be ignored because the researchers are scientists and not historians? Ditto the Little Ice Age with freezing of the Thames, New York Harbour, the Bosphorus and the like. Marcus So Sorry I did not know who Desmogblg was. I was just trying to find a painting covering the Medieval Warming Period. I one of the biggest non believer in all this Climate nonsense and Government Fraud. Just like the Cholesterol Myth. Well, at least it was crowd-funded, voluntarily. Now if only some skeptics could crowd-fund a few studies in diverse locations to see when and where various results are found. How might one find proxies of proxies of proxies in the Sahara, for instance (sorry, my mind harks back to WE’s post)? If all those studies were thermometers skeptics would argue that there were too few stations. Sure they are too few, but they were not homogenized. I’m sure during all of the warm and cold periods we like to generalize there were regions that went against the flow. I doubt if any of them were truly global, just like today. This really demonstrates the fallacy of a global temperature. History is choke full of people proclaiming how clear things are as they either look back or look forwards. These are much like the CO2 boogeyman movement claims. The climate cult and con congregation is busy trying to figure out how to avoid this. As my dad use to say: “Just consider the source.” Columbia University has become a joke, a laughingstock.. At least the Earth Institute and (as co2islife’s Exxon reference above points out) the School of Journalism have. Maybe living in New York City does do something to your world view. Several years ago a friend of mine’s mother-in-law flew out to Colorado to visit. She had never been west of the Hudson. She fully expected a stage coach to pick her up at the Denver airport and deliver her safely past the marauding Indians to Boulder. Even tourism comes into play. Significant climate change that took place on at least a regional scope was responsible for the abandonment of the quint cliff dwellings in Mesa Verde in Arizona. Here’s a nice study showing the MWP in the Gulf of Mexico. Gavin went ballistic when I put it on Real Climate. Well, it came from a USGS study, part of the federal bureaucracy that is supposed to be marching in lockstep with him and with CAGW alarmism. No wonder he went ballistic. It’s like having a Republican on the National Labor Relations board or a conservative as a university liberal arts dean. I find it revealing as well as fascinating that so many of these ridiculous, so called “Peer Reviewed” pieces of trash seem to devolve around ONE Location, ONE Reading, to the EXCLUSION of any evidence to the Contrary! Much like Mann’s single tree representing an entire climate area. All I can say is that there are some really Ignorant “Peers” out there reviewing(?) this tripe! The modern warm period is also “patchy not global”. It mostly is related to winter temperatures over the arctic ocean. It’s so patchy, and the data coverage so sparse, that the term “global” should not be used to describe it. I love the idea that a lack of data proves MWP it cannot be world wide , and I love it because that the range of data supporting ‘the cause ‘ at times comes down to one tree , and general there is far less coverage of data that support the cause than supports the MWP . And yet the first is ‘settled science ‘ and the second not , such approaches really do indicated just how little this really has to do with science , for any descent scientists would see this for the bad joke it is. It is interesting and important to gather evidence that there were some warming both in northern and southern hemispheres. To look at the melting of glaciers and so on. But I think the real evidence lies in the sea level changes. It looks like sea level was higher in MWP than in the LIA. An it was perhaps not higher than today. Let`s just have some good research, without all the politically ridden nonsence. I’m confused. How can a single glacier be a model for an entire region? Is this the same thing as a single tree being a proxy for historical global temperatures? Sure. Or like a single ice core is presented as global. Scientists and the science they “produce” are not so scientific as the layman might think. I recall graduate school pretty well, and the generating idea for a research project often began with someone saying “I think X causes Y.” Almost never with a more neutral “I wonder about the cause of Y”, or “What do you suppose a thorough study of X might show?” Even so, a biased start to a study such as “I think X causes Y” would be fine if the next thought would be “I wonder about what counter evidence there is?”, but I don’t ever recall this being the case either. Skepticism never won a grant. I recall a well known petrologist telling me (c. 1980) that he thought talcum powder caused lots of cancers because talc contains lots of asbestos minerals. He was utterly unaware that cosmetic grade talc is talc not containing asbestos minerals, and has other desirable characteristics as well, such as fine-grained, and plate-like crystal form. Talc containing asbestos, or talc with grainy crystals goes for other uses. So, this “expert” was absolutely ignorant about the topic at hand, but I’ll bet with his credentials he could have gotten a grant from NIH or CDC to study his “idea”, and with the right statistics he may have even been able to find some correlation. There are two separate questions here―(1) did the Medieval Warm Period (WMP) occur in Greenland, and (2) was the MWP worldwide or just regional? The answers to both these questions are clear―the truth lies in specific data from Greenland and elsewhere in the world. Let’s first consider the question of the MWP in Greenland. Data from multiple sources is quite clear. The MWP shows up prominently in the oxygen isotope data of the GISP2 ice core and the GISP2 ice core temperature data. I plotted the original oxygen isotope data (δ18O) of Stuiver and Grootes (1997) for the past 2000 years and there is no doubt at all of the existence of the MWP in the ice core data. It’s very conspicuous. 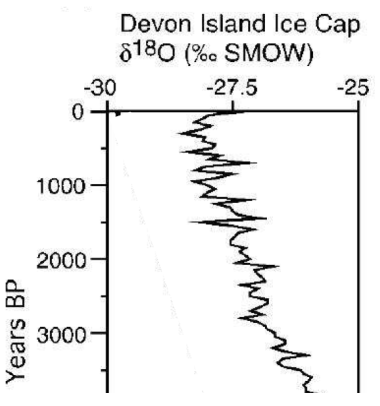 The MWP is also well shown in the ice core temperature data of Cluffy and Clow (1997) and Alley (2000). In addition, the excellent correlation between the GISP2 ice core data and global glacial advance and retreat is well known to glacial geologists. The well-documented settlement of Greenland during this time also confirms the MWP in Greenland. The second question―was the MWP global―is answered in several thousand publications that document the global extent of the MWP. Excellent summaries of many of these publications are readily available online. These studies include data from glacial advances and retreats, ice core isotope data, oxygen isotope data from cave deposits, tree ring data, ocean sediments, pollen, historical accounts, and a number of others. I’ve documented evidence of the MWP in glacial sediments in both the N. and S. Hemispheres. The MWP was indeed global. The evidence of the MWP in Sebastian’s article is fully supported by the GISP2 ice core data and by data from all over the world. He’s got it right. The words ‘straw’ and ‘clutching’ apply to their study in the same way they do to their anti satellite temp video. Both blow a big hole in their scheme. Desperate would be another good word to describe taking samples from a small – or even tiny – area to claim the opposite result to tens of other papers. I was far too angry. I learned something very interesting about about anger once: it is a clue to your deepest values. My deepest values are the nurturing of life and the nurturing of intelligence and knowledge. That [bleep] KNOWS what the phrase “climate optimum” means. His conscious mind might be convinced of the lies he tells, but subconsciously he does know that his actions will result in death. Other people mean nothing to him nor to Young and his team next to his god, grant money. Find the right tree, find the right glacier, find the right statistical method to pasteurize, homogonise and add some permate to the proxy data thus preprocessed and voila!….. Publish this work. Then it will be harder for people to make the kind of claims they are making about the coup de grace for the MWP. Even with people trying to shut out legitimate research, this work should be able to be published, so do it. John, will do it. Currently I am still fighting my way through the literature jungle to get the other 500 papers into the map (-; But it looks as if there are interesting stories appearing when putting all these mosaic pieces together. The mistake occurs on both sides of this debate. The solar side expects warmth [cold] everywhere. The CO2 side expects warmth [cold] everywhere. 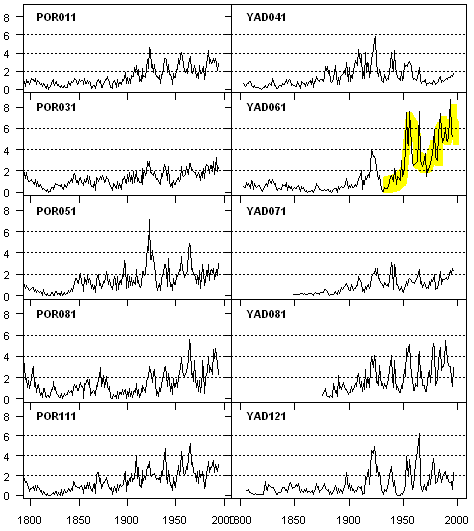 However, if one considers Milankovitch Cycles interacting with long term variations in oceanic/atmosphereic teleconnections, randomly pulsed with large loads of atmospheric sulfur, one should expect a variety of temperature patterns happening at the same time. It could very well be that the Medieval Warm period is best described as colder in some locations and warmer in others as the hallmark of its global pattern. Before 1979, ALL recorded climate changes are patchy, not global, since at best the surface station network covers at best 30% of the planet, and pine trees on the Yamal Peninsula cover much less than that. Sebastian, THNAKS for putting this together and posting it! This one’s a keeper! Some here have suggested you publish this; I add my voice to that. Richard, glad you like it. Yesterday, I have asked the editors of Science Advances if they can give me some space for a discussion. If yes, I will collect all the original data and plot it in a consistent way. This would certainly help to better compare the curves to each other. There is a well documented opposition in temperature between Europe and Greenland and surroundings. Funny, a few years ago when I started writing my blog at http://www.rogerfromnewzealand.wordpress.com I had no trouble finding papers which showed warming in a number of areas around the globe. These included a number studies of Antarctica, New Zealand glaciers and the Pacific Warm Pool. The references are still there on the bar on the right hand side of the page. GISP2, freezing cold in the 8th century, much warmer during the cold Dark Ages period 350-500 AD. 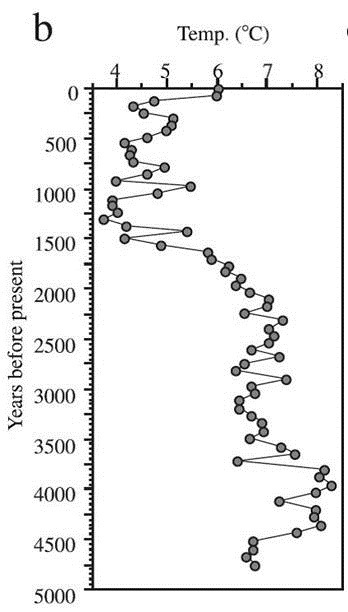 I would expect most people to ignore this as they are too well wedded to to notion that the warm spike in GISP2 around 1000 AD is cognate with MWP elsewhere. The entire concept of scrying the past with chicken bones and proclaiming the future based on your seeings is absurd. That any of this passes for science is a travesty. Arguing about the arguments between demented fools is pointless. If you can hold on to a blade of grass and not fall off the earth, you’re not drunk. If they can find one spot that was cold, then that disproves the MWP ever happened. However if it snows or the Great Lakes freeze over, that’s the result of global warming. Which other projects showed the MWP was spotty? Much like the Current Warm Period, spotty? If they are going to come out with statements like this they should be consistent. No warming then, and no warming now. (this is the first year in a long time that there is still snow on the ground from November. Usually it melts completely between snow storms) I don’t feel we have to rehash volumes of information that the MWP was real and world wide based on one glacier in Greenland. Enjoy this warmer period while it lasts. How do Taxpayers get a refund for this nonsense? “Award Number:1417675; Principal Investigator:Nicolas Young; Co-Principal Investigator:Joerg Schaefer; Organization:Columbia University;NSF Organization:PLR Start Date:09/01/2014; Award Amount:$367,658.00″……..
NSF (aka Taxpayers) listed as providing ‘partial support’ for the “study”. It must have been those pesky, indomitable Viking Cruise Ships that forced settlement of Greenland, eh? period, when there was warming all around this location on map 1 ? global (see the other global studies of the MPW project) MPW….. 1.) This MPW project ist/will be the universal refence source for all future paleoclimate studies. I don’t understand what the problem is. One data set is enough already! I expect that the learned people on this blog will have to work very hard to refute this study. After all, warmists continue to quote the terrible “97%” study in front of congress. The warmists clearly don’t care about the quality of the study as long as they like the results. How about the see saw in temperature between Europe and Greenland?